Have you ever watched cliffhanger? Who hasn’t to be honest. Well the right hand tower was climb in the 1890’s solo by a 17 year old school boy. SO following in his footsteps I headed there to solo the route. I scared myself here, so much I stopped soloing these historic routes and instead headed straight to Chamonix to go bouldering and sports climbing with a friend. 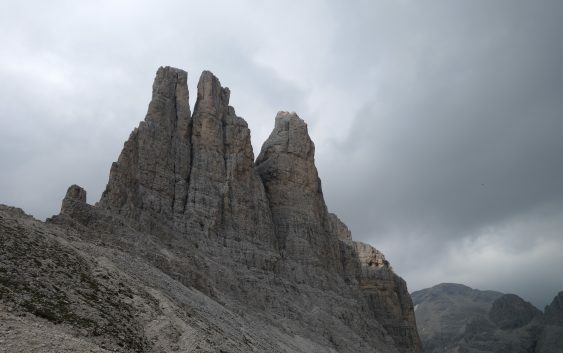 Have you ever dreamed of climbing remote and exposed limestone towers. Well this is your chance. With all the Vajolet powerless than 300m from the nearest Mountain Hut/Hotel. This week will see you climb each of the towers and ascends some of the via ferreta and routes in the areas. This 7 day course costs £2800 and we can take up to 2 people on this amazing adventure. The hut fees will not be included.